Legal advice could be given in GP surgeries to address issues which could exacerbate mental health problems, the Ministry of Justice has said. The move was announced as part of the government review of legal aid reforms – introduced in England and Wales in 2013 to cut the £2bn budget by £350m. The MoJ said legal aid would receive up to £8m extra to support its services. The Bar Council, which represents barristers in England and Wales, said reforms offered “little of substance”. The review follows the significant changes made to civil legal aid in 2013, which meant some types of case were no longer eligible for public funds – including family, welfare, housing and debt. The MoJ said more face-to-face advice would be provided for social welfare claimants. Legal aid could also be provided in GP surgeries as part of an “early intervention” pilot scheme. Justice minister Lucy Frazer said having legal advisers in GP surgeries would mean they could “nip the problem in the bud” by helping with housing and benefits problems that may be “exacerbating” mental health issues. After looking into the impact of the reforms, the MoJ said up to £5m would be spent in “developing innovative technologies” to help people access legal support. It also pledged a further £3m to be invested over two years to help those representing themselves in the court system. What impact have legal aid cuts had? 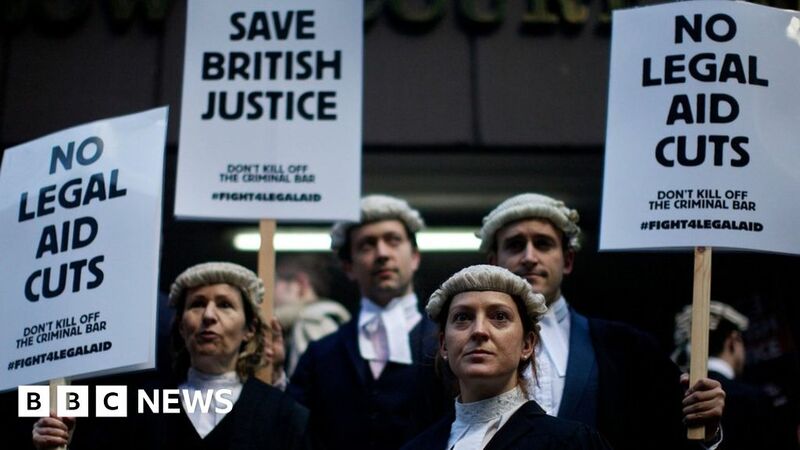 The effects of the 2013 cuts were stark – including a steep rise in people having to conduct their own cases and clogging up the courts. One judge told me of a case involving two litigants in person, neither of whom had English as a first language, who both turned up to court with carrier bags full of documents. A case which should have taken two days with lawyers, took two weeks. The long-awaited review and action plan have been given a cautious welcome by some lawyers groups, but others see it as a sticking plaster on a gaping wound. But the critical factor in fixing the current system lies in the overall funding that the Ministry of Justice is able to secure from the Treasury. It needs to be sufficient to ensure that those who need and deserve legal aid to protect and defend their rights, get it. Richard Atkins QC, chair of the Bar Council, said the council was “disappointed” by the report, which offered “little of substance” to ease the impact of the reforms “on vulnerable individuals seeking justice”. However, Law Society president Christina Blacklaws said the review was a move in the right direction. David Isaac, chair of the Equality and Human Rights Commission, also welcomed the steps taken by the MoJ. He said: “Bringing back face-to-face advice will significantly help those who have faced discrimination seek justice and will be particularly beneficial for many disabled people and those with limited English language skills. The Legal Aid, Sentencing and Punishment of Offenders Act 2012 (LASPO) withdrew aid from many areas of law and led to widespread criticism. It also lowered the means test and scrapped automatic eligibility for those in receipt of means-tested benefits. A BBC investigation in December found that cuts to legal aid had created “deserts” of provision across England and Wales. Solicitors working on legal aid contracts said they had to turn people away “every single day”, but there was no longer anywhere to send them.